Barkley L. Hendricks. “Passion Dancehall #2” (2011). 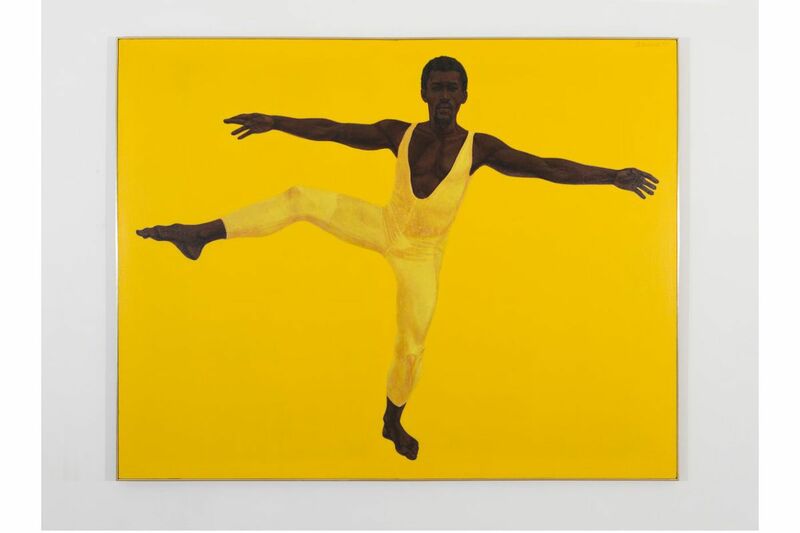 © Estate of Barkley L. Hendricks. Courtesy of the artist’s estate and Jack Shainman Gallery, New York. Estate of Barkley L. Hendricks. Courtesy of the artist’s estate and Jack Shainman Gallery, New York. The pants match the shirt. The shirt matches the shoes. The shoes match the blazer. And so does the bag, if you carry one. Throughout the years, across distinctly different sectors in black American fashion, there has been a recurring trend of monochromatic ensembles. Menswear was styled this way in the zoot suit era, as well as in dandy culture here and abroad. It's how black church choirs often dress. The OGs still show out this way. In earlier hip-hop fashion, shoppers would often look for the sneaker to go with the matchy-matchy tracksuit. More recently, Rihanna and Solange, two contemporary black style figures, both have wowed in looks where they picked a single color and ran with it. A tightly coordinated ensemble might signal celebration time. In Philadelphia, that could be for Odunde, prom, or Easter Sunday. Artist Barkley L. Hendricks, who has been heralded for his lasting influence on portraiture, often captured fellow Philadelphians in matching outfits against single-color backdrops. From priests to pimps, black America has often favored a single color of dress. The threads follow a longer history, experts say, of sacral practice, political resistance, and statement-making. Aug. 18, 1946: A public baptism for members of the United House of Prayer for All People at 16th and Christian Streets. This baptism occurred during a visit from Bishop Charles M. “Sweet Daddy” Grace to Philadelphia. The monochromatic style — or, often, two-tone colorways — acts to communicate part of a "larger history of black sartorial storytelling," said University of Delaware professor Tanisha Ford, author of Liberated Threads: Black Women, Style, and the Global Politics of Soul. Take black jazz musicians, who popularized color-coordinated suits throughout the jazz age, perhaps most notably as part of the zoot suit craze. With the subculture's commitment to both extravagance and elegance, particularly amid racial stigmas and later the fabric rations of the Second World War, researchers note that zoot suits challenged the politics of the day. Trends in tailored suits have varied over the years, especially by fit. But aesthetics from the jazz age have been passed down through the decades. Robert B. Siter Jr., manager and buyer at the Shirt Corner, where many customers still want a bright-colored suit, said the current slim-fit trend with younger men is really a throwback. "They think they invented their own flair," he said. "It's from the '60s." A color uniform can convey a message clearly, said Nadra Nittle, a reporter for the fashion news site Racked: "I think it invites the viewer to question … what the symbolism is of the color in that particular context." Keiko El, a stylist in North Philadelphia and founder of Knooks n' Krannies Vintage, takes her cues from Solange, 1970s fashion, and her mother, but recently she began to organize her style in terms of color palettes. "A few years ago, I started going to therapy and started working on ways to control my emotions a little bit more," she said. Color was a way to make emotional undertones and personal goals apparent. So when she wears red, for example, she's embodying confidence, something she admits she's lacked in the past. Limiting color choices can inspire invention, said Shantrelle P. Lewis, curator, researcher, and Germantown resident. This is similar to "the improvisation that exists within jazz music — to still articulate your creativity and your style, while still maintaining the conformity of having to look like everyone else." Trannie "Train" Jasper of West Oak Lane coordinates suits in lavender, pink, mauve, and "grass green," among other colors, for special occasions and every week for church. "I don't wear just anything. It's got to be hot and it's got to be right," he said of his Sunday best. "That's just what we do." Trannie “Train” Jasper often coordinates his suits for church, such as this blue-and-peach ensemble. Lewis, also the author of Dandy Lion: the Black Dandy in Street Style, talks about how black dandies wear their cultural and political defiance by bucking the color sensibilities of corporate America and mainstream European fashion. But history informs the political and social significance behind black style: Self-expression through clothes would have different meanings for a black laborer accustomed to uniforms or a resident in the Jim Crow South who risked attack if dressed too well, Ford said. Lewis noted that slaves who could not own property could count clothes as their possessions. Growing up, Ford recalled her peers insisting on matching down to the precise tint. This reflected one's personal flair, but the achievement of coordinating every garment just so was also a "question of access." "You couldn't have a tomato red and cherry red and a hot pink red. You couldn't have these clashes," said Ford. "It had to be seamless." “Passion Dancehall #2” (2011) by Barkley L. Hendricks. For Nittle — half Yoruba, half African American — her father, his wife, and her brother wore blue before she said her wedding vows, then changed into all purple afterward, a ritual to signify "making that transition to someone else's clan," Nittle said. "It's interesting to see the intersections coming together all the time," Nittle said. "I think for a while we thought we had lost our connections to West African traditions. When we see something like this, it's a reminder that these connections are still there." Khalia Abner, a graphic designer who lives in the Northeast, regularly wears black outfits. She theorizes that monochromatic dress in the community comes from a desire to look put-together, but she dresses that way because of an old job at Max Studio. "That's what we were required to wear, so I really haven't broken out of that." Lewis believes African Americans aren't always aware that their culture reflects traditions from the African continent. Ingredients in food, dance moves — and color and prints in fashion. That a pimp and a priest would dress similarly, Lewis said, is "Africanism" showing its face.